What do our Norwegian cousins really want? My ancestors were Norwegian farmers, which is to say they lived in small, remote cabins without electricity or running water. In search of a better life, many of them left Norway for America, where they built farms hundreds of times the size of the tiny cotter's plots they had cultivated in Norway. But cousins who couldn't, or wouldn't, leave Norway have fared well, too. Just one long lifetime after my ancestors emigrated, proceeds from North Sea oil began driving up living standards. Now, Norwegians routinely vacation abroad, drive freely despite $4-a-gallon gasoline, and live better than all but a few societies in the world. For many Norwegians, however, there's something missing in this blissful picture of comfort and plenty in a setting of surpassing beauty. 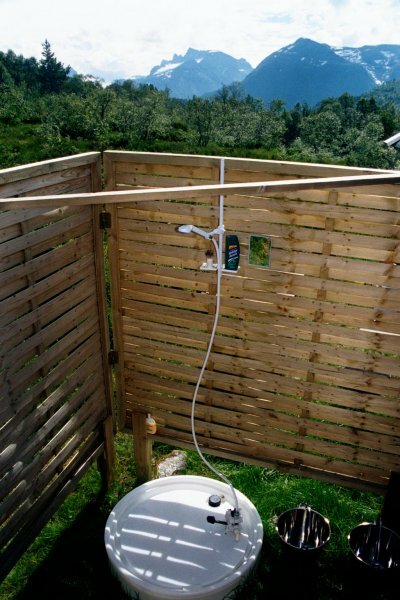 What many Norwegians really want, it seems, is a small, remote cabin without electricity or running water. If the cabin is in the mountains so much the better. A cabin like the one happily owned by my cousin, Glenn Murray, and his family. 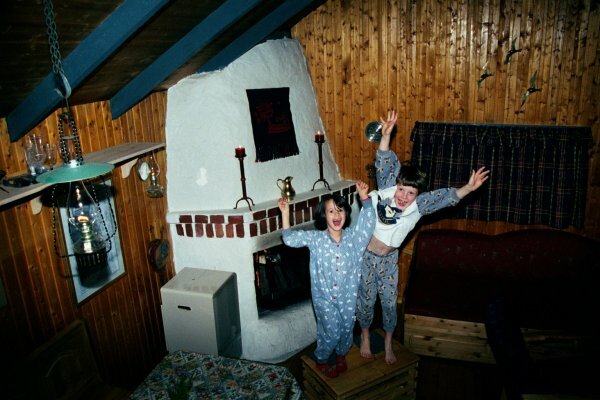 Despite a lifelong interest in Norwegian ways, I did not fully appreciate this longing for a back-to-basics outdoor lifestyle until July of 1999, when I visited Norway in search of ancestral haunts and relatives I had never met. One of them was Murray. For a year I had been exchanging emails with Glenn, who was born and raised in Veblungsnes, a small village on the Romsdal Fjord a few miles from the farms where my Ellefson, Johnson and Brudelie ancestors had lived in the Romsdal Valley. The son of an English father and Norwegian mother, he has a keen interest in genealogy. As far as he could determine, I was related to about half of the families in the valley. 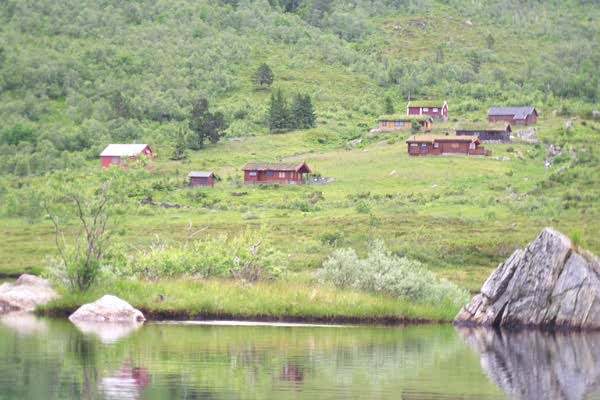 As luck would have it, Glenn, his wife and two children were scheduled to arrive at their mountain cabin north of the Romsdal Fjord about the time I would arrive in Norway. He not only invited me up for coffee, but sent detailed directions that even an American ought to be able to follow. "The walk to my cabin takes about 15 minutes," he wrote. Since I am an experienced wilderness camper, hiker and canoer, it seemed like an easy jaunt. So, another cousin, Johannes Rusten, a thoroughly fit Norwegian from my Gudbrandsdal lineage, and I followed the narrow public road up the mountain to a point where it gave way to a narrow private road. Eventually, we parked in a leafy dirt lot. So far, so good. The trail through the surrounding bog vanished after a few feet, but how often do I get a chance to hop from rock to rock, trying to keep my feet dry? We were going by dead reckoning. There wasn't a cabin, or anything else man-made, in sight. By the time 15 minutes had passed, one thing was clear. We were lost. So, we back-tracked to the parking lot, then set out again in search of the missing cabin. By this time, I had developed a stone-hopping rhythm, and only occasionally slid into the water or "mud". In tune now with his wilderness muse, an apologetic Johannes led us straight to the cabin. During a pleasant visit, Murray explained that the fireplace had grown a little larger than expected because the builders drank as they slathered on "mud," so they slathered longer than was necessary. Then Glenn took us on a tour of the farms where my grandmother Anna (Johnson) Lee's ancestors had lived in the Romsdal Valley. As I worked at my family history over the next year, however, my journalistic instincts kept prodding me to look more closely at the love of many Norwegians for the remote location and primitive lifestyle. Murray, for instance, describes his retreat, with fervor, as "the core of things, the real thing." "If you want the image, you can go to a mountain resort duplicating every comfort of home - and get as close to nature as any television screen." "A hytte delivers you to nature." "Unfit as a human habitat, some people argue. No running water? No electricity? No road?" "My answer was, so what? It is a different kind of life. For those of us who can not bear the thought of a life without watching the golden eagle and the arctic loon from the kitchen window - to us, this is not even a minor inconvenience." "I find myself unable to communicate the feel and the smell of clothes washed in the stream and left to dry under the big old pine, nor can I fully describe the light of candles and kerosene lamps when there is no other source of light, the heat of mountain birch burning in the open fireplace, or the freshness felt after a two-buckets-of-hot-water outdoor shower on a frosty morning." "There is no such thing as water from the tap, but it is the tap that is missing. Water is plentiful and an improvement on its urban cousin." "No road means silence, a silence that every once in a while turns the sound of distant waterfalls into a roar." "Winter means complete silence, as if any sound is absorbed by the snow." 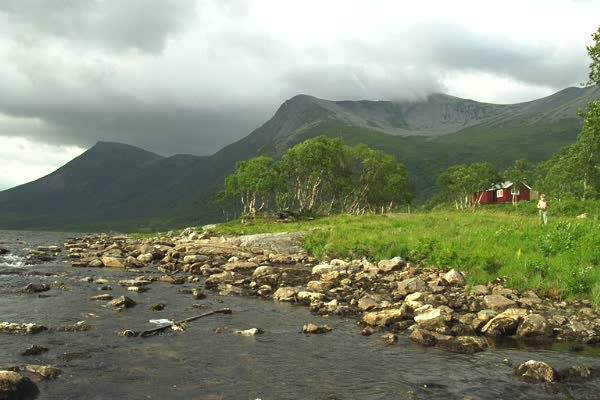 Like Murray, Thomas Hylland Ericksen, a professor of social anthropology at the University of Oslo, describes the hytte as the doorway to the great outdoors, a rugged mountainous wilderness that holds an almost mystical place in the Norwegian psyche. The landscape, he believes, holds the answer to questions that have been vexing Norwegian thinkers for years. What does it mean to be Norwegian? Can a Norwegian-American, like me, truly be a Norwegian? Can a Pakistani immigrant wo learns the language, eats the food, loves nature, and skis at least 500 miles cross-country each winter become a Norwegian? Norwegians have been asking such questions for a generation, since they tired of being thought of as "reserve Americans" and became embarrassed that frozen pizza is, in fact, the national dish and blue jeans, not the bunad, the real national costume. They have struggled with their identity, experts say, because they didn't have the chance to develop the cultural icons that other European countries used to kindle national spirit in the 19th Century. Until 1814, Denmark was in control for 400 years, the written language of Norway was Danish, and educated Norwegians looked to Copenhagen, not Oslo. Then Sweden took control for another century. When Norway finally won its independence in 1905, its cultural cupboard was wanting, its only monumental building was the Nidaros Cathedral in Trondheim, and geography was largely what distinguished Norway from Denmark and Sweden. Instead of a Wagner, whose music stirred the blood of Germans, Norway had produced a Grieg, who studied music in Germany, but then went home to compose gentle, lyrical, often whimsical, music that celebrated Norway's landscape and folklore. He did much of his composing in a tiny wooden hut on the edge of the Hardanger Fjord, where he had a view of the fjord and, beyond, the Folgefonna Glacier. "In the heart of this matchless amphitheater of nature, surrounded by the most sublime and majestic scenery in Norway, Grieg placed his grand piano and his writing desk," wrote biographer Harald Herresthal. "Here he sat, like an Orpheus reborn, and played in his mountain fastness, among the wild animals and rocks. His music came from the depths of rural Norway, where the quick and resonant tones of the Hardanger fiddle met his ear, and the Hardanger Fjord's shifting moods enchanted his eye." As Grieg celebrated the landscape with music, others did so with words and pictures. "This is where nature and veneration of nature come into the picture," says Eriksen. "What Norway lacked in cultural riches, it made up for in its diverse, rugged and majestic landscape. National poets took to writing poems celebrating the mountains and wide-open spaces, and painters portrayed wild and untamed Norwegian scenery." "Norway's national identity gradually took the form of a lifestyle characterized by closeness to, respect for, and love of nature, particularly the subarctic mountain landscape requiring great courage, strength and endurance from those who have to survive in it." "Danes and Swedes were in this light refined and decadent city people, and the image of the thoroughly healthy, down-to-earth, nature-loving Norwegian was established as a national symbol." But who invented the hytte ? No one, says Murray. He argues that the hytte is simply the modern incarnation of the seter , or mountain farm, an ancient institution that reached its heyday in the mid-19th century. To preserve the hay on their farms for harvest in the fall, and feed for their animals in winter, farmers began herding their cows, sheep and goats up the mountains in the spring, where they would graze throughout the summer. Often a teenage girl, or milkmaid, would tend the herds, living in a small room at the end of a hut that also housed the farm animals. The milkmaid would draw the milk and then make butter and cheese. On the weekends, the farmer would bring fresh supplies and collect the butter and cheese, which he would sell. Sometimes, seter huts were built in a cluster, and the inhabitants danced and partied on weekends. As long as labor was cheap and plentiful, the seter system thrived, but decades of emigration and rising wages eventually took their toll and the use of setre declined in the last half of the 19th Century. In the mid-20th Century, consumers began insisting on milk, butter and cheese that looked and tasted the same from week to week, and the seter , as an agricultural institution, died. The appeal of seter life appears to have lived on, however. "My grandparents got running water and electricity in their home just after World War II," Murray said. "It must have been like heaven." "Yet, every year in early June my grandmother and her youngest child would leave the newly found luxury to go to Skorgedalen," the mountain wilderness where the Murrays have their hytte . "Her husband would join her every Friday night, walking up from the northern shore of the fjord. Grandma would stay there until school started in late August." "When the use of the seter for its original purpose declined, the people in the valley still took to the mountains as soon as the snow was gone. Why?" "I have a feeling that there was something about life on the so important that people refused to let go when the seter ceased to be a part of the agricultural economy." That phrase, "something about life on the seter , " is a term of art. While searching abandoned mountain farms for solreiper , or primitive sundials, years ago, Murray found unmistakeable evidence that many of the young women who had staffed those farms had a keen interest, at the most practical level, in birth control. "The cabin is the starting point for private expeditions into the great outdoors, on skis in the winter, on foot in the summer. Spending a whole day in the cabin is viewed as immoral and meaningless. Not before evening is it legitimate to relax in front of the fire with a game of cards and perhaps a drink, and you should be physically tired from the day's nature experiences." "Simplicity is a virtue in all areas of cabin life, although it is now generally acceptable to have a small portable radio. On the other hand, it is still controversial to have a television in the cabin, not to mention a VCR." "Skiing in the intense Easter sun, with a backpack containing oranges, chocolate bars and cocoa, is viewed by many Norwegians as one of the strongest, most positive experiences they can imagine...the mountains at Easter time occupy a special place in the Norwegian self-image, as a symbol of the good life in Norway." "Hiking and going for walks are a way of getting out of the house...you leave civilization and all its comforts and depravity behind to get in touch with your inner self and feel like an authentic person. Hikes and walks can be taken on a weekday after work, but are usually a weekend activity. A normal yardstick for gauging the success of a walk is the number of people you meet along the way. The fewer the people, the more successful the walk was." Do you catch a glimpse of yourself in any of this? I do. With a wife and two young children in tow, I once spent 36 hours without seeing or hearing anyone else while canoeing deep in the Boundary Waters Canoe Area in northern Minnesota. That is the fact I talk about whenever that adventure comes up - no one else was there. Now, Norway not only has a population attuned to nature, but a pantheon of heroic figures who reinforce the perception that to be Norwegian is to be outdoors. Norway's best known philosopher, Arne Næss, led Norway's first Himalayas expedition in 1950, helped to inspire the green movement and has influenced environmental thought worldwide. 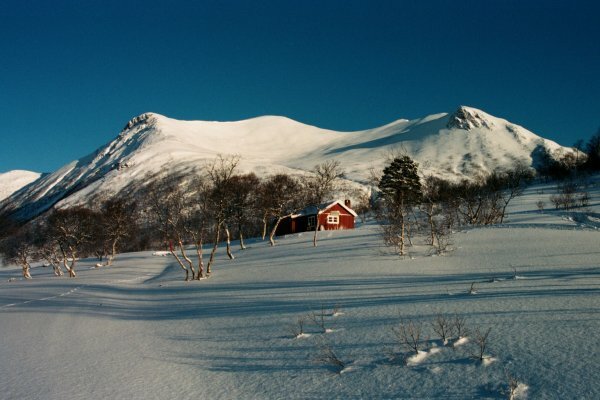 He spent much of his time in a tiny, isolated hut well above the tree line in the mountains between Oslo and Bergen. Fridtjof Nansen, a larger-than-life scientist, explorer, inventor and diplomat, was the first to cross Greenland on skis, in the hope that he could establish Norwegian colonies there and in other parts of the arctic that he had explored. To motivate his expedition, he started from the barren and hostile east coast of Greenland, which meant that he and his crew had to go forward or die. Having made his mark in rugged, inhospitable places under harsh conditions, Nansen is generally considered to have forged the prevailing self-image of the Norwegian as a respectful and benevolent master of the outdoors. Late in life he was awarded a Nobel Peace Prize for his humanitarian work, but in light of his improbable life and career this most-coveted of all prizes seems incidental. Early in 2001, another hero joined the pantheon. Kjetil Andre Aamodt captured his 14th medal in Olympic and world cup Alpine skiing competition, becoming the greatest Alpine skier in history. The Norwegian government is, of course, vigilant in protecting the environment, which is vital not only to the lifestyle and peace of mind of Norwegians, but also to tourism and the image of Norway throughout the world. Surprisingly, the government has glimpsed a new threat. Even more surprisingly, it is the hytte . Minister of the Environment Siri Bjerke says that "cabin palaces" are popping up here and there and is afraid of what these, left unchecked, might do to Norway's countryside. While collecting information from local councils, she is thinking of asking for legislation to limit the size of cabins. While the hytte appears to be a symbol of the primitive lifestyle unblemished by gadgets or technological wizardry, it is, in fact, a testament to both lifestyles. What you see is the primitive. What you don't see is the wizardry, which serves primarily as a backup for emergencies or moments when the pleasures of roughing it have worn thin. "There is more in that small cabin than meets the eye," Murray acknowledged. "By turning a switch we can illuminate the cabin with electric light. The lamps are powered by an accumulator which in turn is reloaded by solar cells. There is also an inverter so that AC equipment up to and including 180 W can be used ." "If we need more power, say, for the vaccuum cleaner, we have to trade silence for efficiency. In the shed at the back there is an 8 HP combustion engine driving a 4,5 kW generator." "We also have a refrigerator. Running on propane, it operates in total silence. Propane is also used in the kitchen oven (more sophisticated than many electrical counterparts), and in the mobile 3,2 kW catalytic heater." "The valley is out of range of any base-station for modern mobile phones, but if I feel like making a call I power up an old 450 MHz transceiver and can dial direct to any public telephone network in the world."